Adolphe Adam's ballet, Giselle, premiered on June 28, 1841, at Salle Le Peletier inParis, France. Adolphe Adam was a French composer whose notable works include his balletsGiselle and Le corsaire. He was born in Paris in 1806, to a musical father who taught music at the esteemed Paris Conservatoire. Adolphe was a student at his father's conservatory, but rather than follow instruction, he would improvise his own compositional styles. In addition to composing various vaudeville songs, Adolphe played in an orchestra after graduating from school. However, it was his organ playing that earned him enough income to live comfortably. With a goal in mind, Adolphe saved enough money to travel across Europe composing scores for multiple opera houses and ballet companies. By the end of his career, Adalphe Adam had composed nearly 40 operas and a handful of ballets. Arguably, his most famous work is "Cantique de Noel," which is the quintessential piece of Christmas music known as "O Holy Night." Théophile Gautier (1811-1872) was a highly esteemed writer and critic. Famous for his poetry, novels, drama, and hard-to-classify literary style, his fans included other great writers like Oscar Wilde and Marcel Proust. Jules-Henri Vernoy de Saint-Georges (1799-1875) was a skilled and sought after librettist. Saint-Georges's famous libretti include Gaetano Donizetti'sLa fille du régimentand Georges Bizet's La jolie fille de Perth. In an idyllic German village set within the rolling hills of a vineyard near the Rhine River during the middle ages, Hilarion pays a visit to Giselle's cottage early in the morning to leave behind a bouquet of fresh flowers before she begins her day. Hilarion is secretly in love with Giselle and has been for quite some time. Moments before Giselle steps out of her cottage, Hilarion quickly runs into the forest without catching her attention. Meanwhile, before the break of dawn, the Duke of Silesia has made his way into the village upon which his castle overlooks. The Duke is a very handsome man and is betrothed to Princess Bathilde, but he seeks the affection of Giselle. Several days prior, the Duke had laid eyes upon the beautiful Giselle. He has returned to the village disguised as a peasant in order to see her. Along with his attendant, Wilfred, the Duke moves into a nearby cottage. 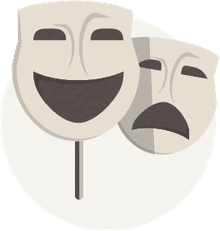 While disguised, he can keep his authoritative position secret as well as his impending marriage - he's determined to live a double life for as long as possible. When the sun rises and the villagers exit their homes, the Duke introduces himself as Loys to Giselle. Giselle is immediately drawn to him and falls deeply in love. When Hilarion returns, he warns her not to trust the stranger so willingly, but she doesn't listen. Giselle and Loys continue to dance in merriment. She picks a daisy from a nearby bed of flowers and proceeds to pluck its petals, asking if "he loves me" or "loves me not." Giselle, believing the outcome is going to be bad, stops counting and throws the flower to the ground. Loys promptly picks it up and counts out the remaining petals to her. The last petal confirms he loves her. Happy once more, she continues to dance with him. Berthe, Giselle's mother, does not approve of Giselle's infatuation with the stranger and immediately orders her back into the house to finish her chores. Horns are sounded in the distance, and Loys quickly departs. Princess Bathilde, her father, and their hunting party stop by the village for refreshments. Giselle and the villagers happily greet their royal guests and Giselle dances for them. In return, Bathilde gives Giselle a lovely necklace. After the hunting party departs, Loys returns alongside a group of grape harvesters and a celebration ensues. As Giselle dances and joins in the excitement, Hilarion returns with information about the stranger, Loys. Hilarion has been researching the stranger, even going so far as to snooping through his cottage. He produces the Duke's noble sword and horn. To everyone's dismay, Hilarion sounds the horn and the hunting party returns. Giselle cannot believe it. Driving herself mad, she pieces together the Duke's lies, and throws herself onto his sword, falling lifelessly to the ground. It wasn't the sword that killed her, though. Giselle had a very weak heart and was warned by her mother that too much dancing would one day be the cause of her death. Underneath the bright pale light of the midnight moon, Hilarion visits Giselle's grave and mourns her death. As he weeps, the Wilis (vengeful female spirits who died abandoned on the day of their weddings that haunt and kill men), dressed in all white, rise from their shallow graves and dance around him. Hilarion becomes so frightened, he runs back to the village. Meanwhile, the Duke has ventured out into the dark night in search of Giselle's grave. 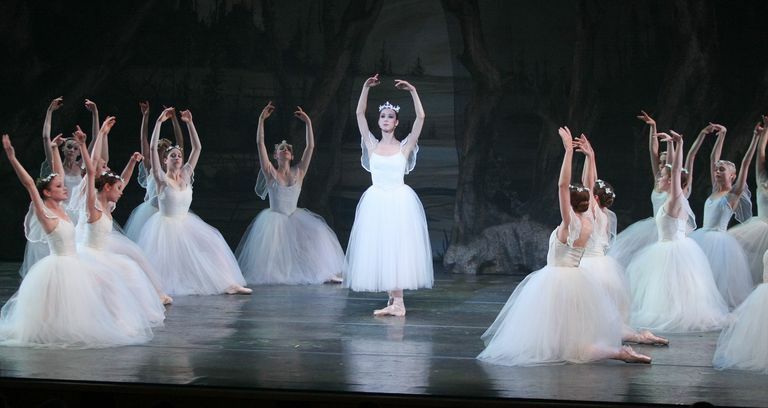 The Wilis raise Giselle's spirit when the Duke draws near. The spirits disappear and the Duke is reunited with Giselle. Even in the afterlife, she still loves him and is quick to forgive his deception. The two lovers dance well into the night until Giselle vanishes within the shadows. Meanwhile, the Wilis have pursued Hilarion who is unable to escape their torment. They chase him into a nearby lake, causing him to drown. The evil spirits turn their sights to the Duke and are determined to kill him, too. The Wilis Queen, Myrtha, emerges and the Duke begs for his life. Showing no mercy, she and the Wilis force him to dance without stopping. Giselle reappears and protects the man she loves by fending off the Wilis and their attempts to torture him. Finally, the sun rises and the Wilis return to their graves. Giselle, overflowing with love, has rejected the vengeful spirits and not only saves the Duke's life, she manages to save her own eternal life. She returns to her grave in peace knowing that she'll never have to rise at night to hunt down the lives of men.